Quiche and frittata are two words that are normally heard in the kitchen or on the dining table. Some of you may have even seen these words in the menus of restaurants. They actually are two dishes which are more or less the same with a few differences. Many people consider them to be the same but if you know enough about what you eat, you will be able to point out the difference very soon! Quiche and frittata are both are egg dishes, that is, contain egg. The taste is further enhanced by the addition of meat, poultry, cheese, vegetables etc. Usually only these few things are added but that varies in different places and cultures; some people add other things as well. In the past, the two were usually considered to be breakfast dishes with the normal trend being having them in breakfast only. This was due to the presence of egg which is usually associated with breakfast. However, with further additions of new ingredients to these dishes and the nutritional value of eggs becoming widely known, quiche and frittata are no more restricted to the breakfast table. They are easy to make dishes that can usually be made with any of the above mentioned ingredients that are available. However, the two are indeed different in some aspects that we are now to discuss. If a custard base is used and ingredients are added to it then what is being prepared is quiche. Note that the custard base is a combination of eggs and cream (loads of it!). This is responsible for adding to its flavour and contributing to its delightful creamy consistency when baked. If a person needs to reduce the fat content then half the cream can be replaced by milk. What makes a quiche different to a frittata is the fact that it usually has a crust although that is not always the case. A frittata on the other hand does not have a crust. The eggs are top-billed. The milk content is lower and there may be no milk at all. Similarly, there is little, if any cream, compared to quiche. The most common way to make a frittata is to cook it first on the stovetop, and later finish it under the broiler. To further differentiate the two, a quiche can be described as an open tart that is filled with a mixture of eggs (in the beaten form), pieces of bacon and crème fraiche. It is usually served very hot and as a first course. Frittata, on the other hand, is more like an omelette, but it is flashed under the grill at the end to finish off the cooking. There are various types of frittatas; the Italian frittata varies from being thin and pancake like to being thick with a crust (usually golden) and a creamy centre. These frittatas can be filled with meat, seafood, vegetables or cheese and can be eaten warm or cold. The dishes are quite similar in the way they are made and arguably have similarities in their flavour as well but they are different in terms of where they originated from. A quiche is a savoury dish that originated in France, in the region of Alsace Lorraine. 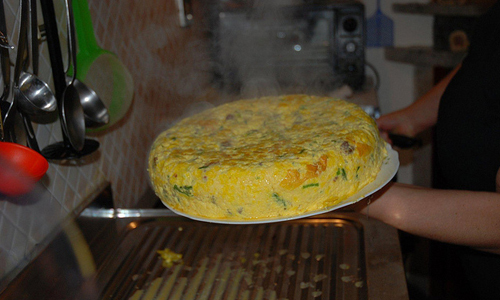 The frittata, in contrast, originated in Italy and is part of the famous cuisines Italy has to offer. Both frittata and quiche are usually pie-shaped but once again, this is not always true as it varies from culture to culture and various chefs have their own way of preparing foods. The differences are with regard to the ingredients and the method of cooking. A quiche is entirely cooked in the oven whereas a frittata is initially cooked on the stovetop and later transferred to the oven where it is further cooked until ready. allana. "Difference between quiche and frittata." DifferenceBetween.net. September 30, 2014 < http://www.differencebetween.net/object/comparisons-of-food-items/difference-between-quiche-and-frittata/ >. I wanted to know what consistency of frittata should be, thought way to cake like, over cooked??? Was ok,out,of oven, sat for an hour or so. Wasn’t vibrant!! !